Today what we wear seems to be very important importance us. For example, if we are going to a wedding, we dress differently than we do when we go to watch a football game. When we are joining a crowd, we tend to dress ourselves in the manner that we feel the others at that particular event will be dressed. Some events require certain attire. However, not everyone feels like complying with the norm. It is not unusual to see someone in the mall dressed in their pajamas! We also see many different ways that people choose to dress their loved ones for their funerals. Some have suits on their husbands, and others like to see them in the type of clothing they always wore. This is of course, a personal preference of the bereaved or perhaps the wishes of the loved one that has passed away. My husband had a tendency to like to be different. Usually, he was in conformity to the norm, but on occasion I would have to say he “stood out”. Maybe he would be one of the few in the crowd with his wide brimmed “western” hat on. Phil had suffered and fought his cancer for two years. At one particular time during his battle it didn’t look like he was going to live much longer. My husband had been trying to use his illness as a witness to others. I knew that a suit was not his favorite attire, and thinking about how he liked to be a witness to others I decided to design him a T-shirt. One thing I kept in mind was also the fact the he and his close friends always seemed to be in competition for one sport or another. 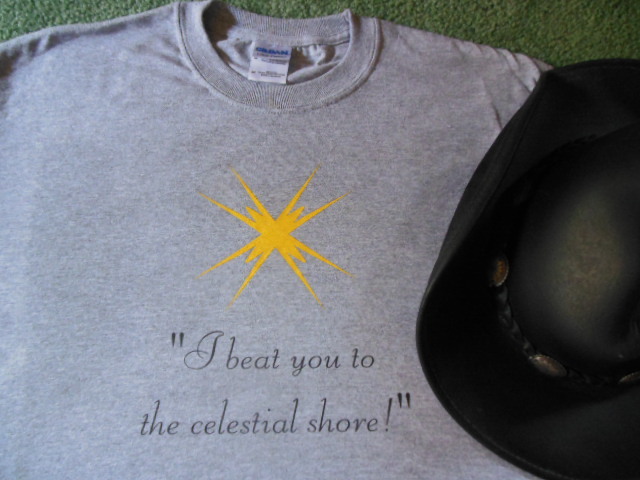 I came up with the saying “I beat you to the celestial shore!” I showed it to him before ordering it and he was very happy with its design. God spared his life at that particular time, but since I had ordered it in two sizes, knowing how his weight changed with each relapse and remission, he was able to wear it when God did decide to take him home. Needless to say the shirt did give some laughs to his friends. He had had the last say and beat them at one thing for sure. In 2 Corinthians the Bible tells us that at the believer’s death he will be “clothed upon” with a “house from heaven.” This house from heaven is something to be desired. We “groan” to leave this cumbersome body. Our body that is now the tabernacle of God desires to be released and clothed with our house from heaven. We can rejoice for our loved ones in heaven that they are no longer clothed with this earthly body, a body that continues to fall apart, decline, and fail. Praise God they are clothed with their house while they await for a new, resurrected body!